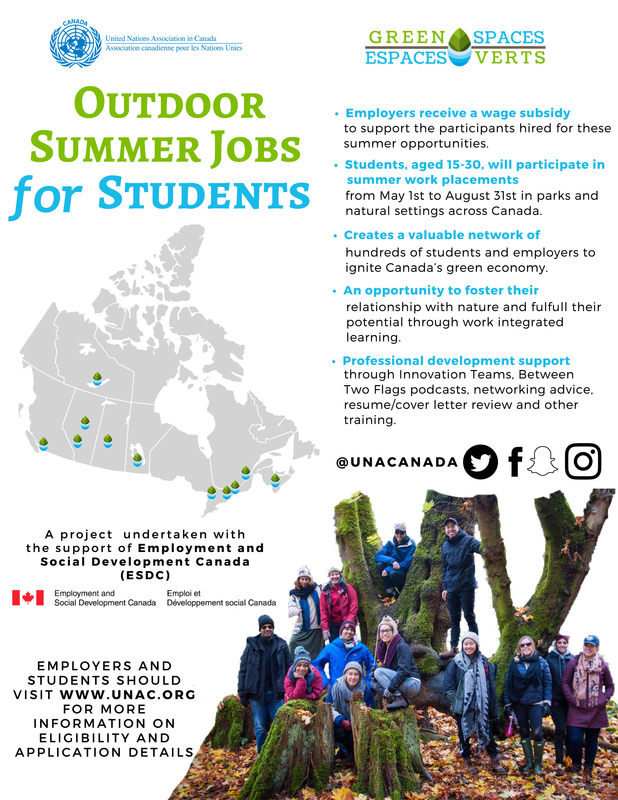 If you’re an organization, business, government, post-secondary, or Indigenous organization employer looking to hire someone to work on environment-related initiatives, or a student (aged 15-30) looking for an environment-related summer job, you’ll want to check out the United Nations Association in Canada (UNA-Canada)’s Green Spaces/Espaces Verts initiative. Green Spaces/Espaces Verts connects youth with employers for summer work placements that take place mainly in parks and natural settings. The focus is on reducing carbon emissions and community engagement around carbon reduction. UNA-Canada subsidizes about 50 per cent of the wages, and employers can become part of a national Green Spaces/Espaces Verts network to showcase and support their green efforts. You’ll need to act quickly: the application deadline is April 19, 2018 for jobs taking place between May 1 and August 31, 2018. See further details and links for students and employers to apply on the Green Spaces/Espaces Verts website. Thanks to UNA-Canada for the information.